Designed for the space conscious outdoor enthusiast and bird watcher, the new ultra compact Barr & Stroud 8x25 Sprite Mini roof prism monocular is possibly the best value in the market today. Featuring optical performance equal to, or better than any competitors comparable product line, the Barr & Stroud Sprite Mini is waterproof and features rugged rubber-armoured construction for years of performance. Designed to be used single handed. It features a soft rubber eyecup which enables the monocular to be used with or without spectacles without damaging them. All Sprite Mini monoculars feature BaK-4 prisms and fully multi coated lenses to provide optical performance that is equal to, or better than anything in its class. All Sprite Mini monoculars are manufactured from lightweight polycarbonate which reduces overall weight and makes them extremely rugged and durable. A rugged rubber armour covering quietens down bumps and protects your Sprite Mini monocular from abrasions and damage from regular use. Waterproof, Fog proof & Nitrogen Filled to ensure many years of performance. All Sprite Mini monoculars come supplied with case. Designed for the space conscious outdoor enthusiast and bird watcher, the new ultra compact Barr & Stroud 10x25 Sprite Mini roof prism monocular is possibly the best value in the market today. Featuring optical performance equal to, or better than any competitors comparable product line, the Barr & Stroud Sprite Mini is waterproof and features rugged rubber-armoured construction for years of performance. Designed to be used single handed. It features a soft rubber eyecup which enables the monocular to be used with or without spectacles without damaging them. All Sprite Mini monoculars feature BaK-4 prisms and fully multi coated lenses to provide optical performance that is equal to, or better than anything in its class. All Sprite Mini monoculars are manufactured from lightweight polycarbonate which reduces overall weight and makes them extremely rugged and durable. A rugged rubber armour covering quietens down bumps and protects your Sprite Mini monocular from abrasions and damage from regular use. Waterproof, Fog proof & Nitrogen Filled to ensure many years of performance. Designed for the space conscious outdoor enthusiast and bird watcher, the new compact Barr & Stroud Sprite 10x50 monocular is possibly the best value in the market today. Featuring optical performance equal to, or better than any competitors product line, the Barr & Stroud Sprite is waterproof and features rugged armoured construction for years of performance. It comes with twist up eyecup so that it can be used with or without glasses with equal comfort. Designed to be used single handed or on a tripod with equal ease. All Sprite spotters feature BaK-4 prisms and fully coated lenses to provide optical performance that is equal to, or better than anything in its class.  Polycarbonate construction  All Sprite spotting scopes are manufactured from lightweight polycarbonate which reduces overall weight and makes it extremely rugged and durable.  Rubber armour covered  A rugged rubber armour covering quiets down bumps and protects your Sprite spotting scope from abrasions and damage from regular use.  Waterproof, Fog proof & Nitrogen Filled  All Sprite Series monoculars are waterproof, fog proof and nitrogen purged to ensure many years of performance. 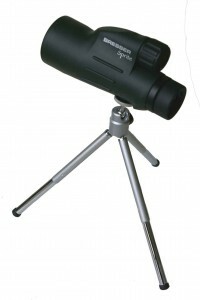  Accessories  All Sprite monoculars come with case and table top tripod. Designed for the space conscious outdoor enthusiast and bird watcher, the new compact Barr & Stroud Sprite 20x50 monocular is possibly the best value in the market today. Featuring optical performance equal to, or better than any competitors product line, the Barr & Stroud Sprite is waterproof and features rugged armoured construction for years of performance. It comes with twist up eyecup so that it can be used with or without glasses with equal comfort. Designed to be used single handed or on a tripod with equal ease. All Sprite spotters feature BaK-4 prisms and fully coated lenses to provide optical performance that is equal to, or better than anything in its class.